Donald Trump’s flurry of executive orders attempting to make good on the worst of his campaign promises left many feeling overwhelmed. But the chief executive has neither the powers of a dictator nor those of the head of a family-owned corporation. Trump is attempting a “Shock and Awe” campaign. (I didn’t pick a photo of him happening to look intimidating. 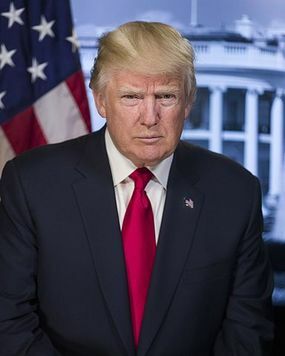 It’s his official White House portrait) It will work only if the 2.7 million civil servants employed by the United States actually allow themselves to be cowed. This is directed at you: please don’t! And to the rest of us: we need to support them! There are two paths here. One is marked by Sally Yates; employees of the Park Service, EPA, NOAA, NASA, and other agencies who are using Twitter to defy gag orders; and those at the Department of Human Services who repeatedly used its official Twitter account to urge people to sign up under the Affordable Care Act after the Administration ordered ads for the program pulled. If you follow the path of doing your jobs and adhering to the law regardless of what higher-ups order, we are in for a rocky time but will be spared what would in effect be a dictatorship. If you follow the path of caving in to illegality and gag orders, you are giving a dangerous clique power to which no presidency is entitled. As a lawyer, I find misleading the catechism that “we have a government of laws, not of men (and women).” The claim leaves out the enormous power officials have in interpreting what laws mean and deciding which to enforce, and against whom to enforce them. And yet it expresses an important truth: Trump’s authority is far from unlimited . The president certainly has the power to issue executive orders. Some are simply statements of policy, such as the priorities of the administration. The Supreme Court has consistently held, however, that more substantive orders must be pursuant to a specific power given to the president in the Constitution or delegated by Congress. Congress appropriates funds, under authorization laws which state where and how they are to be spent. Every agency’s mission is set out in these and other statutes. Their implementation is spelled out in regulations, adopted according to the Administrative Procedure Act, after formal publication and receipt of public comments. Changes in the regulations require a similar process. Much government action must also accord with contracts the U.S. has made with civil servants and outside entities. Parties aggrieved by actions which violate these strictures can and do appeal, within the agencies and in the courts. Moreover, every department has its own legal staff, which generally vets significant changes in advance. In this light, if you work in an agency affected by the papers Trump has been signing, we need you to ask, “Can he really have us do that?” The answer is often “no.” Federal district judges in New York, Massachusetts, Virginia, Washington, and California all issued emergency orders blocking removal of people affected by Trump’s immigration ban. Each judge had to make a quick finding of a high probability that full litigation would prove that people were being denied liberty without due process or equal protection of the laws. Translation: the illegality of excluding people with an already-established legal right to enter (or return to their homes here) was practically a no-brainer. Trump was less brazen with the Dakota Access and Keystone XL Pipelines, though many thought he gave them the go-ahead. The DAPL order directs the Army to reconsider its prior orders, in an expedited manner, “to the extent permitted by law and as warranted.” Similar language is in the Keystone XL order. Both obvious unconstitutionality (the travel ban) and orders to “try to do what I want but follow the law” (the pipelines) leave room for appropriate choices by those of you whom the man relies on to carry out his will. Remember, even those serving in the military are obliged to disobey unlawful orders, although following that duty entails obvious and serious risks. Perhaps you have a clear notion of what legal authority governs your work, or maybe you simply follow established routines. In either case, integrity, patriotism, and a human regard for the consequences of one’s actions on other beings require everyone who is directed to make a significant change — from undersecretaries to outsourced janitorial staff — to do three things. First, recognize that DJT has always been a man who will sometimes do what he can get away with, which means that the legality of his orders cannot be taken for granted. Second, learn what makes what you have been doing in your job lawful, and find out if the change the president (or those implementing his edicts) seeks is equally lawful. Finally, reach deep inside yourself and decide whether you need to take a stand. If you have a religious or spiritual practice, now is a good time to seek guidance from whatever you understand the Divine to be. If it is time to stand up, it is unlikely you will need to do so alone; talk to your colleagues and/or your union or professional organization. If you need to tip off the press, get a guarantee of anonymity and do it. This is already happening in the agencies mentioned above and others. 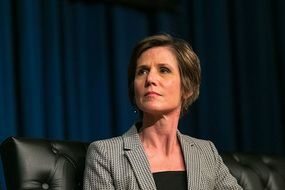 Few will have to pay the price Sally Yates did, and she and any like her will no doubt be welcomed elsewhere. In a way, though, it is unfair to ask this of you without a movement in civil society to back you up. If I had my way, we would, by now, have a non-corporate-funded, membership-based political party, focused not on elections, but on building a massive movement for policies which effectuate the values and needs of a majority of Americans, and of the planet. Its members and allies would certainly shield you in whatever way you needed. But even today, a virtually-unknown Obama-prosecuted whistleblower’s family can reach out and receive $99,000 in support online. In a single weekend after the travel ban was announced, donors gave the ACLU six times its usual annual online contribution total, and you can bet they will use some of it to support federal workers who are retaliated against for following the law. We will be there for you, too. The degree to which law constrains the presidency does not mean that there is no danger here. If you let fear of the consequences of “just saying no” to the president’s unlawful demands empower him to dictate policy, we are truly moving towards dictatorship. Whether his Shock and Awe tactic works or not depends, therefore, on whether you who are supposed to be intimidated by him submit. Ultimately, this will be true of the rest of us as well.